(a) Apply lithium soap base glycol grease to the inside of the small opening of a new No. 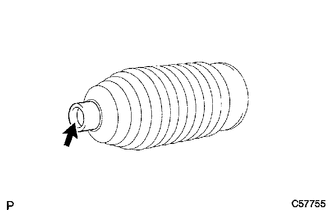 2 steering rack boot. (b) Install the No. 2 steering rack boot to the groove on the rack housing. Be careful not to damage or twist the boot. Make sure that the boot is free of rust and foreign matter. Perform the same procedure as for the No. 2 steering rack boot. (a) Using SST, tighten a new No. 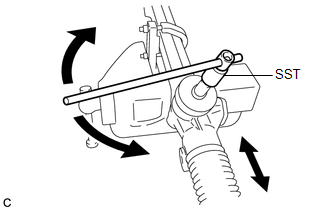 2 steering rack boot clamp as shown in the illustration. (a) Using pliers, install the steering rack boot clip. 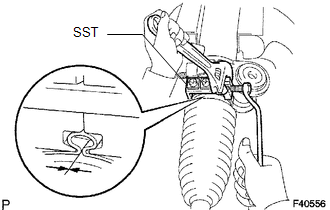 (a) Using SST, rotate the pinion shaft to see if both the left and the right steering rack boots expand and contract smoothly. If the operation cannot be done as specified, use new steering rack boot clamps and reinstall the steering rack boots.